The art of creating figurines is both complex and fascinating. Even before the carver’s tool meets the wood, many years have elapsed. Each of the Alpine maple trees selected for use is handpicked. Each of the trees must be at last eighty years old. Since only unblemished sections of the tree are used, the tree must grow to a fairly large size before enough good wood is available. The trees are cut only during the winter, when sap is running out of the tree. Once the trees are felled, they are cut into boards, which in turn must left to stand for three to four weeks until the sap has completely drained. However, this does not complete the seasoning process. Wood boards that have not been rejected by quality control experts must be kept outside until they have a moisture content of 8-12%, a natural process that takes from two to three years. Again a certain portion is rejected, and then the remaining wood is kiln dried – the final stage before the wood enters the carver’s hands. At each stage the wood must be carefully watched. Flaws in texture, shape, grain, moisture or any number of other elements may cause the wood to be discarded. Control is so tight that 80% of the wood originally cut never reaches the carver’s table. All the time spent in preparing the wood and in the education of the craftsmen culminates when the carver’s tools meet wood. 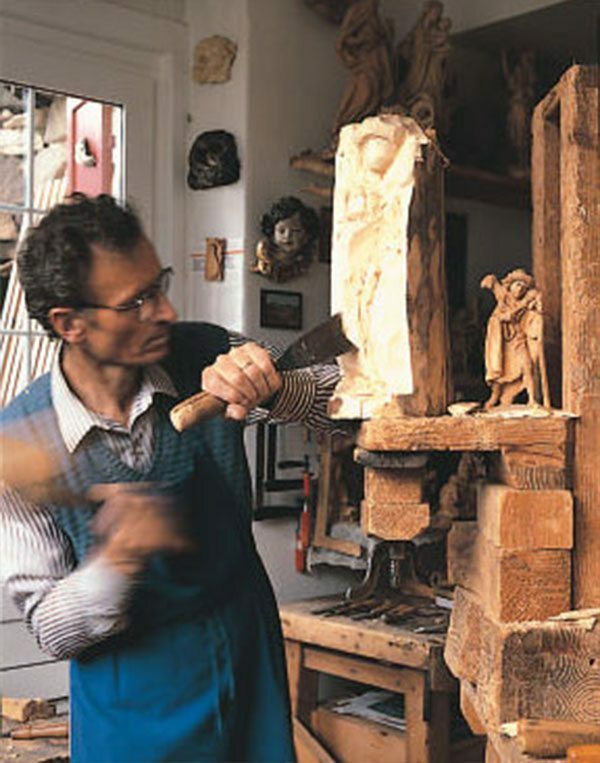 Once the rough cut is completed by lathe, the sculptor then uses progressively smaller and finer tools to gradually work his way toward the extremely fine detail carving. At this stage of the process, any slip destroys the sculpture. Only after considerable hours the carving is completed, at which time it arrives in the hands of the painter. Skilled hands are required to paint the wood carvings. Transparent oil and water colors are used to ensure the grain of the wood remains visible. The original works of the artists often serve as a model. The exclusive craftsmanship ensures that each piece is different and preserves its individual character. Throughout the entire production cycle, from the raw wooden board to the delivery of the works of art, a continuous quality control takes place. Val Gardena carvings are still appreciated all over the world. The fine carvings are the result of many hours of precise and patient handwork. It exemplifies an art proudly handed down from generations, a combination of artistic talent, diligence and ability.